And Here is Paul’s Film Review of ‘Mood Indigo’!! The great Wizard of Oz once said “pay no attention to that man behind the curtain.” Like that tale of wonder, Mood Indigo attempts to transport the viewer to a land somewhere over the rainbow. The viewer is urged to pay attention to the smoke and mirrors of silly, sometimes stunning, visuals to hide the fact that there isn’t much else to see. Indigo lacks the same charm or sense of purpose as Oz; instead of magical storytelling, the viewer gets slapstick farce. 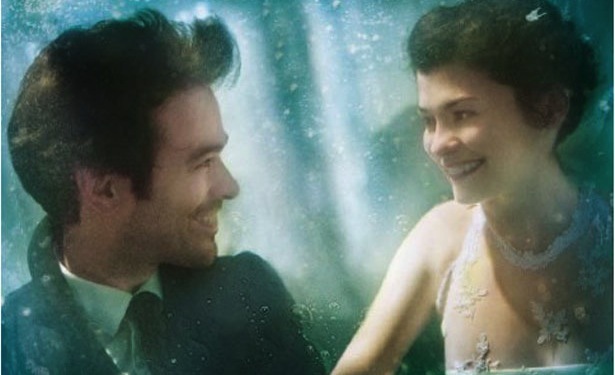 Mood Indigo takes place in a surreal France. Wealthy, but lonely Colin (Romain Duris) meets and falls in love with the charming, and equally quirky Chloe (Audrey Tautou). With the help of his friends Chick (Gad Elmaleh) and Nicolas (Omar Sy), Colin quickly gains the affections of Chloe and they fall in love. Shortly after their wedding, Chloe falls ill. As her condition deteriorates, Colin does everything he can to seek a cure for his wife. Lives and friendships are put to the test as tempers and finances begin to falter. The film begins with a quote by French writer, Boris Vian, (roughly translated to) “this story is completely true since I made it up from beginning to end”, giving the viewer a sneak peak at what to expect. Known for his surrealistic style, those familiar with Vian’s work have an idea what they are in for as they are immediately bombarded with odd and downright confusing visuals. Among these visuals are a few prominent glimpses of: a pianocktail (combination of piano and bartender), dozens of typewriters on conveyor belts, a doorbell that acts as a spider, and an actor in a mouse costume. It’s like something out of a Terry Gilliam film. This stylistic choice is both the downfall and potential saving grace of the film. Without much context, many viewers will likely find themselves lost in this nonsensical world. Introducing such images was a bold, intelligent move, but the idea of “everything in moderation” seems lost on writer/director Michel Gondry. It was wise to paint the surrealism thoroughly from the start. In this way, the audience will be exposed early enough to the imagery so as to accept it as normal by the time the tone of the film darkens. However, Gondry attempts to use his imaginative brush far too often. As a result, many visuals pass through the screen quickly in too large a number to be fully digested by the audience. It seems a sad waste of film budget as most of the images end up losing effectiveness. The speed at which many of these scenes pass also creates a sense of silliness that contrasts ineffectively with the darker tones presented as Chloe’s sickness worsens. Fortunately, Gondry puts on the brakes halfway through the film. He doesn’t abandon the wild imagery, but instead finds his balance between visuals and storytelling. Unfortunately, the move comes too late to save the film entirely, and too suddenly to blend neatly. You can easily pinpoint the moment in the film where the imagery begins to actually add merit to the film. The end result is a Jekyll and Hyde film. The first half is quirky and silly, but too over-the-top to be anything but fluff. The second half of the film finds its mark and creates a beautifully blended allegory – using the images presented as powerful metaphors to bring a bit of light to the rather dark tone. So drastic is this change that it is almost necessary to create two separate rankings for this film. This fault in the film rests solely on the shoulders of Gondry. The film is cast well and all the actors play their roles with convincing charm and devotion to the world around them. Notable performances by Sy and Tautou bring a sense of merit and charm to what would otherwise be a rather trite and unoriginal script. The visuals themselves are done well and with the sense of a budget far larger than what was actually available. Unfortunately, Gondry seems lost as to what to do with all the talent at his disposal until Chloe’s sickness takes hold. From that point forward, the film settles down and really feels like a tale worth watching. Had the film found its footing from the onset, there is no doubt it would warrant a very favorable ranking. The charm of Sy, Duris, and Tautou, together with the beautiful allegorical second half would make for a “must have” film, had it been done throughout. Unfortunately, the haphazard nature of this film (rather ironic considering the context) creates an unbalance too severe to ignore. It is a rather unfortunate missed opportunity. This entry was posted on Sunday, August 3rd, 2014 at 7:10 pm	and is filed under Film, News. You can follow any responses to this entry through the RSS 2.0 feed. You can skip to the end and leave a response. Pinging is currently not allowed. « Justin’s Film Review of ‘Mood Indigo’! !